Canada is a land of diversity, a land where nature and culture collide in an exciting, eclectic and exhilarating mix to form a uniquely Canadian experience! As you journey along the Rideau you’ll be able to travel through three of Ontario’s most spectacular and distinct regions – Ottawa with its gentle surrounding countryside, quaint, historic villages of Ontario’s Highlands and the stunning lakes and plains that mark your approach to Kingston and the Great Waterway. 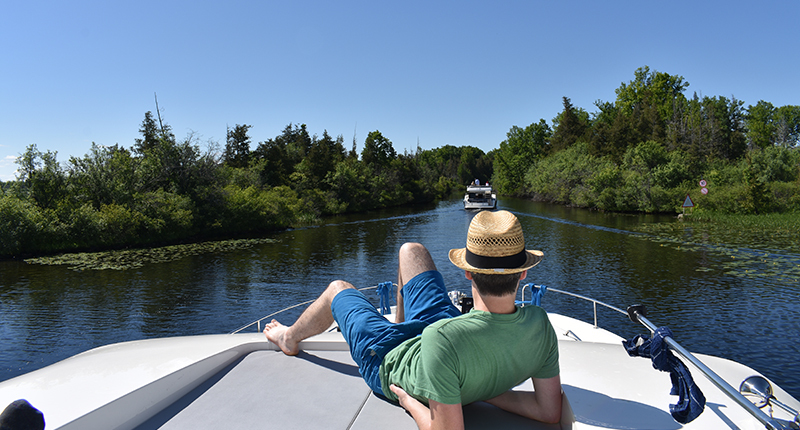 With these three regions stretching beyond the Rideau itself, a journey through Ontario with Le Boat forms the perfect accompaniment to a wider Canadian adventure! Ottawa is a uniquely beautiful place: an urban center on the edge of nature where you can enjoy outdoor adventures alongside architectural wonders. It’s a place where you’ll hear English and French spoken in the streets and where you can discover Canada’s proud heritage and national treasures. 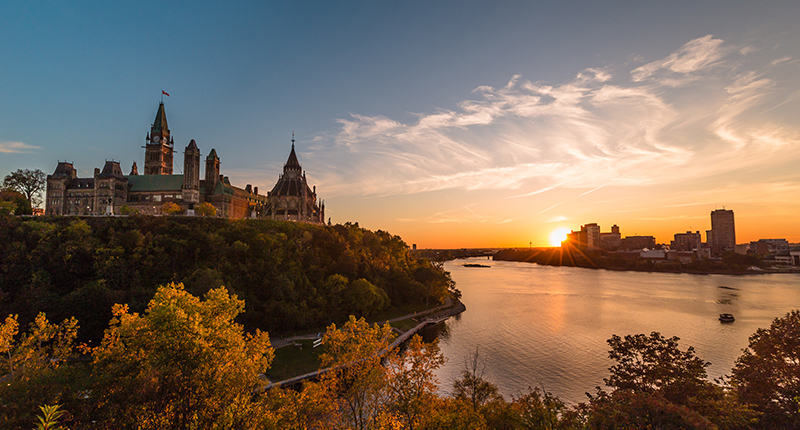 Parliament Hill is the centerpiece of Ottawa's downtown landscape, the political and cultural heart of the city. In the summer, a massive yoga session is hosted on the front lawn at noon on Wednesdays, and at night the buildings become the backdrop for a stunning bilingual sound and light show. With seven national museums in Ottawa you can explore the breadth of Canadian history and heritage all in one place. Explore Ottawa’s distinct local neighborhoods, including the historic ByWard Market. By day this area boasts a bustling farmers’ market and chic shops, by night it hums with activity at the restaurants, pubs, and nightclubs. Sometimes the best way to reconnect is to disconnect, slow the pace, and just wander, letting every new discovery along the way become its own opportunity to stimulate the senses and nourish the soul. A beautiful, unspoiled region nestled between Ottawa and Toronto, Ontario’s Highlands is the perfect escape for an unrehearsed day. Follow your guide, dressed in traditional voyageur clothing, as you travel back in time to relive Canada’s exciting and colorful history while exploring scenic wilderness with Canadian Voyageur Adventures. Rent a kayak, canoe or bike with Rideau Tours, Heritage Bikes & Rentals, or Perth Outfitters and paddle (or peddle!) the day away. Lose yourself in the story before your eyes during a performance by the Classic Theatre Festival or discover the rich, and somewhat haunted, history of Perth during a theatrical walking tour. Cast a fishing line from a rocky outcrop. Visit Victorian towns and military blockhouses. Cycle a woodland pathway and picnic alongside hand-operated locks on the 19th century Rideau Canal. This historic waterway, linking a scenic string of rivers and lakes from Ottawa to Kingston, Ontario, is maintained and operated by Parks Canada – a Canadian government agency. 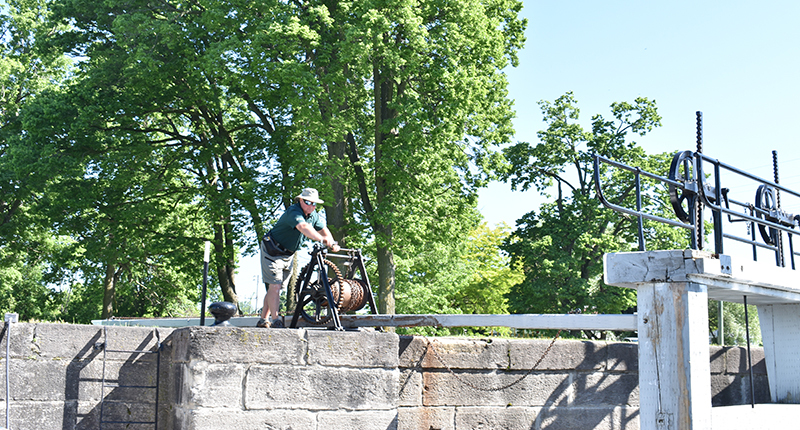 Paddle or motor through the Rideau Canal National Historic Site’s historic lock system for a day or a week. Swim sandy beaches, go fishing for a mighty Muskie or a tasty Bass and Walleye, watch for wildlife, and camp at lockstations run by the friendly Parks Canada staff. Boaters, cyclists and hikers can pitch a tent amidst the history of the Rideau Canal’s lockstations, enjoying a unique camping experience with the comforts of a well serviced campsite. Visitors can also stay in one of Parks Canada’s oTENTIks. A cross between a rustic cabin and a tent, the Parks Canada oTENTik is a relaxing, easier way to experience camping. Located at Upper Nicholsons Lockstation, Beveridges Lockstation, and Upper Brewers Lockstation, the oTENTik accommodations provide an ideal base camp for exploring historic canals in Ontario. 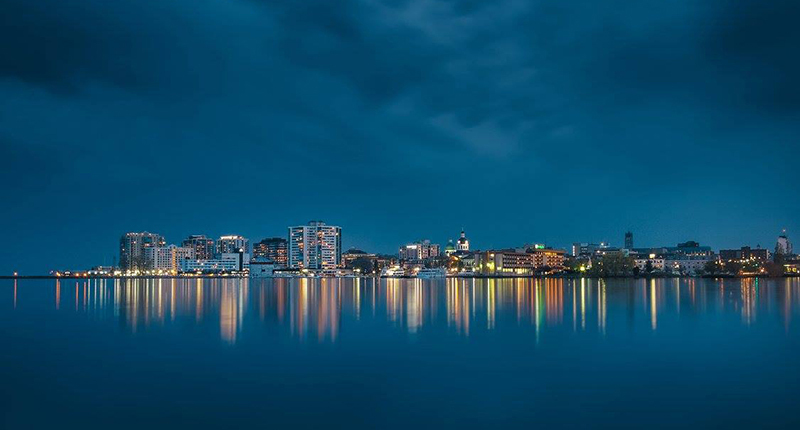 Steeped in history, yet always changing – stay in Kingston – where culinary, culture and creators meet. Experience world-class festivals and events, a vibrant culinary scene, a passionate local maker movement and plenty more by day and an exceptional variety of accommodations by night. Kingston is the perfect place for your getaway. It’s where small town charm meets big city offerings – most within walking distance of the historic downtown core. Indulge in Kingston’s impressive restaurant scene – with more restaurants per capita than any city in Canada, you’re bound to find some new favorites. Experience Ontario’s historic site and living history museum, Fort Henry, where visitors enter the realm of 19th century military life in this beautiful fortification. Satisfy your cultural cravings with world-class performances and exhibitions at The Grand Theatre, The Isabel, The Agnes Etherington Art Centre, and more.